It was the second trip to the Juvenile Fillies (G1) with an OBS graduate for Mr. Ciaglia and Peter Eurton. They finished third in 2011 with Weemissfrankie, trained by Eurton and owned by Sharon Alesia, Bran Jam Stables, Ciaglia Racing, LLC and Rob Dyrdek. The daughter of Sunriver, a two time grade one winner of $559,920, went through the ring in the 2010 August Sale before she was purchased at the April Sale. . 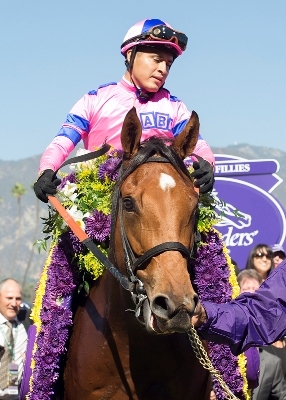 Champagne Room is the fourth OBS graduate to win the Juvenile Fillies (G1). February graduate Brave Raj won the 1986 renewal and Stardom Bound (March ‘08) and She Be Wild (April ’09) scored consecutive victories in 2008 and 2009.